Midhurst lost their second SCFL division one game in a row - going down 5-4 in a nine-goal thriller on a bitterly cold afternoon at Steyning’s Shooting Field. A lacklustre first half made it impossible for the Stags to take control and get a foothold in the game and they saw the hosts race into a two-goal lead through Dom Ozga and Rob Clark inside 15 minutes. Kieran Carter got a goal back on 25 minutes with a coolly-taken penalty after Nathan Casselton was tripped in the box after a mazy run beating several players. Steyning regained their two-goal advantage on 35 minutes with a fantastic strike from Mohammed Al-Samaraie, giving Billy Nash no chance in the Stags goal. Midhurst found it hard to break down the hosts and often found themselves on the back foot. They got a lifeline on 40 minutes when Harry Giles slotted home from close range. A Liam Dreckmann corner was whipped in and met by Duncan Brown, who nodded down for Giles to get his first of the day. Just before half-time Aaron Behan set Gary Norgate free. The striker tried looping the ball over the oncoming keeper only to be thwarted. Giles with the follow-up could only roll the ball back to the stopper. The second half started just as the first half had. Steyning were dominant and dictated early play. Again they got two early goals, scored by Ozga and Alex Townley and raced into a 5-2 lead. It seemed as if the floodgates would open as Midhurst looked beaten and dejected. But tide seemed to turn and Midhurst, perhaps with nothing to lose, took some control. Another Dreckmann corner found Giles who finished well from close range to restore some pride. Attack after attack saw Norgate, Kieran Carter and Dreckmann all go close. Harry Tollworthy and Giles began to express themselves in centre midfield and make things happen. It was those two who got the Stags going for goal four – Giles’ third of the day. A loose ball after a quick attack found the midfielder 20 yards out and he unleashed a thunderous strike which nestled into the top corner. 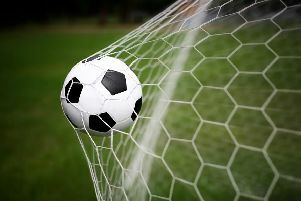 It was 5-4 with 15 minutes to play and on 90 minutes, Dreckman picked up a loose ball on the byline and cut the ball back to Norgate who was lurking eight yards out. He nodded home but controversially the assistant flagged for Norgate being offside. Midhurt felt it was made even more frustrating was the lack of communication between referee and his assistant. In the 92nd minute Dreckman fired in a drive from 25 yards but it was excellently saved. Midhurst: Nash, Casselton, Broughton, Brown, Behan, R Carter, Tollworthy, Giles, Dreckmann, Norgate, K Carter. Subs: Fewell, Nursten, Hill, Kason. * Midhurst host near neighbours Selsey on Saturday.